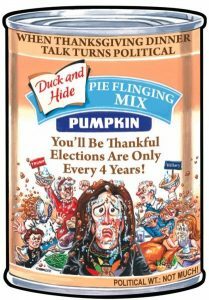 Turkeys, holiday shopping and even Donald Trump! 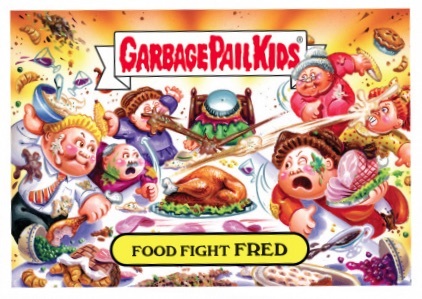 2016 Topps Garbage Pail Kids Thanksgiving gets into the the holiday spirit with another online-exclusive sticker set. 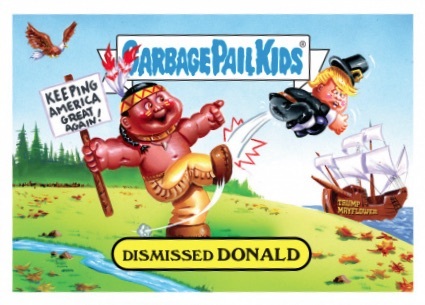 Consisting of 11 total cards spread across six main GPK designs, most of the stickers showcase two different captions on the same image. 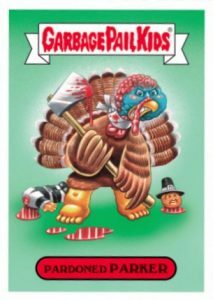 Featuring politics, the effects of eating turkey, Black Friday shopping and a homicidal bird, the small release touches on several topics. Priced at $9.99 per design bundle, with most containing two cards, collectors can also purchase the full set for $29.99. 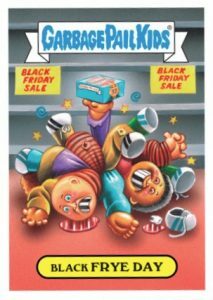 2016 Topps Garbage Pail Kids Thanksgiving is sold through through the Topps Online Store for one week before sales are ended and the final print run is announced. 11 cards. Card #6 only has 1 version. Available at Topps.com until 11/28/2016 at Noon EST.